SHE is beautiful, captivating, intelligent and highly talented. 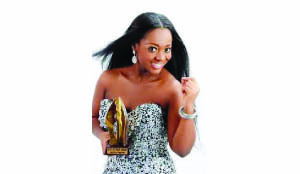 The Ghanaian award-winning actress, Jackie Apiah, is billed to visit Zambia on May 6, 2014, curtesy of Zambia’s Afrowood. Interestingly, Jackie is not on this trip alone as she is coming along with two other star actors that have so far made a huge impact with regard to telling the African Story to the world. Star actor Prince David Osei, who is a brilliant young actor and a darling, especially Zambian female Nollywood fans, is coming along with Jackie. The other star is Andy Boyo who the brainchild of the movie titeld “Off the Hook”. As movie producer and director, Andy takes an interesting role in movie to be premiered at Fresh View Cinema in Lusaka. Not only talking about the coming artistes, the movie, “Off the Hook” is one that Afrowood director Kangwa Chileshe says can only be missed by one’s choice as it is captivating and a real comedy drama. A huge apprehension among the fans is inevitable looking at the inclusion in the movie of legendary actors like Nigeria’s deep-voiced Alex Usifo. Now in “Off the Hook,” Jackie ( Dr Mimi) surprisingly falls in love with Danny a mental patient admitted to St John Mental Hospital! This was after she learns and discovers the sorrowful truth behind Danny’s mental derangement. The two start to communicate in the language that is best known by the heart attracting apprehension from the Head of Hospital Dr Sorgbordjor who also has seen Dr Mimi has developed love interest.